He doesn’t get off any intentionally funny lines…that’s Barney’s job. He doesn’t come off as especially kind…that’s Marshall’s job. He doesn’t have an oddball moment…that’s more something Lily tends to have. He doesn’t have any out-of-chraracter moments yet…though it probably would have been good to give him a an out-of-character flash of bad-assery to make us like him more. He doesn’t really have a unique-but-universal “I thought I was the only one who did that!” moment in the pilot. TED: Here’s how it breaks down: I’m 27 now. I’ll make partner at my architecture firm by 30, so that’s when I’ll start looking. It’ll take two years to meet her, that’s 32. We date for a year, and at 33, I propose. Then you need a year to book a room and a decent band. That puts me married at 34. So, yeah, marriage is the furthest thing from my mind right now. This is, in its way, appealing. This is an exaggerated version of something we all do. It’s telling that Ted’s MOH is of the laugh-at, not laugh-with variety, but it gets the job done: it establishes his vulnerability, his social problem, his inner flaw, and, yes, his charm, such as it is, all in one speech. A character on Friends came out with a similar timeline for life in the thirties -- complete with postponing marriage and children in order to meet the demands of those who book weddings. I've really enjoyed the posts about HIMYM. With Ted's character, the issue mostly comes down to acting. I believe if you switched Jason Segal into Ted's role and vice-versa everyone would complain what a drip of a husband Marshall is. 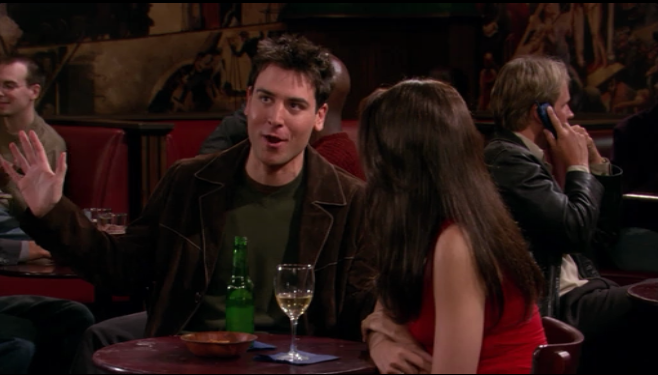 I feel though that Ted has been the anti-Ross from Friends (who went from semi-cool nerd to freakshow over time). Ted's performance has improved through the seasons (and the writers for the show are amazing and have worked within his limits) so his character has become much more engaging. That all being said, I do appreciate the writing insights you've presented of how to make the "everyman" character engaging.